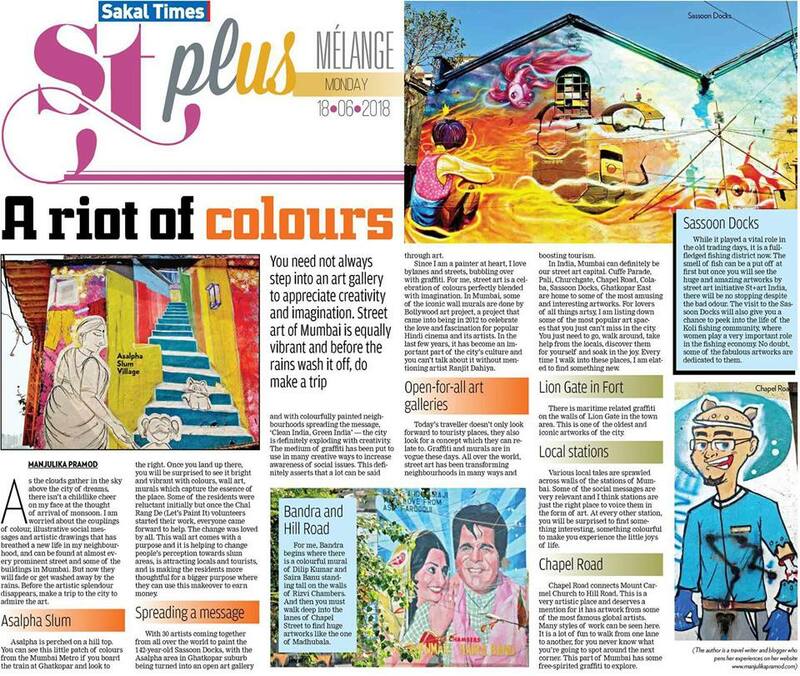 The below article ‘A Riot of colors’ was published in ST Plus of Sakal Times on Monday! As the clouds gather in the sky above the city of dreams, there isn’t a child-like cheer on my face at the thought of the arrival of the monsoons. I am worried about the couplings of color, illustrative social messages and artistic drawings that had breathed a new life in my neighborhood. I know the rains are essential but my heart goes out to the big and small art work, beautiful murals, colorful schemes and social messages that are splashed at almost every prominent street and some of the buildings in Mumbai. 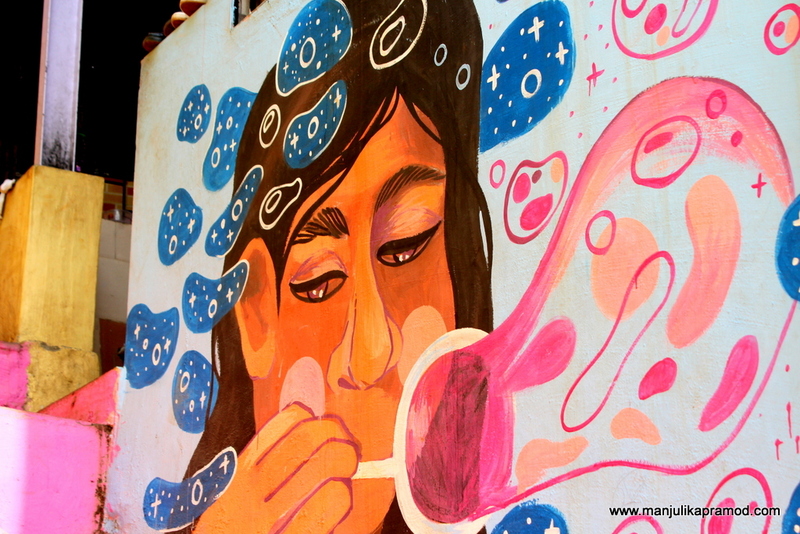 During this rainy season, a lot will change about the city, especially the wall art might get destroyed at many places. I wish the artists have used water-resistant spray paints though I know they have not at many places. Before the rains wash away the splendor of the work, you must go and take a pause from the mundane world to admire the art. 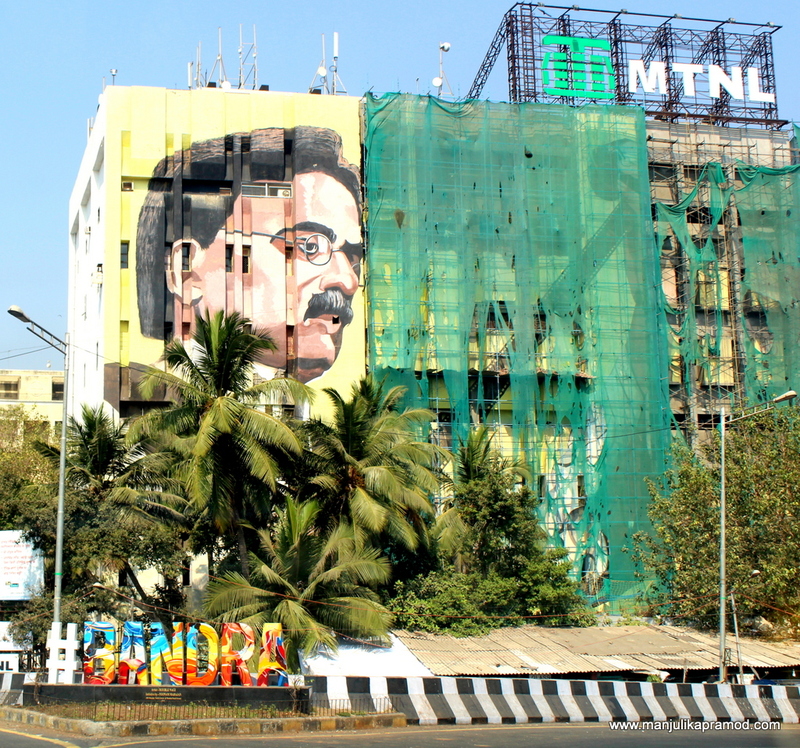 Nowadays, nothing celebrates the spirit of Mumbai better than its street art. The colorful palette of the city has evolved unlike before. With 30 artists coming together from all over the world to paint the 142-Year-Old Sassoon Docks, with the Asalpha area in Ghatkopar suburb being turned into an open art gallery and with colorfully painted neighborhoods carrying ‘Clean India, Green India’ messages all over Mumbai, the city is definitely exploding with creativity. 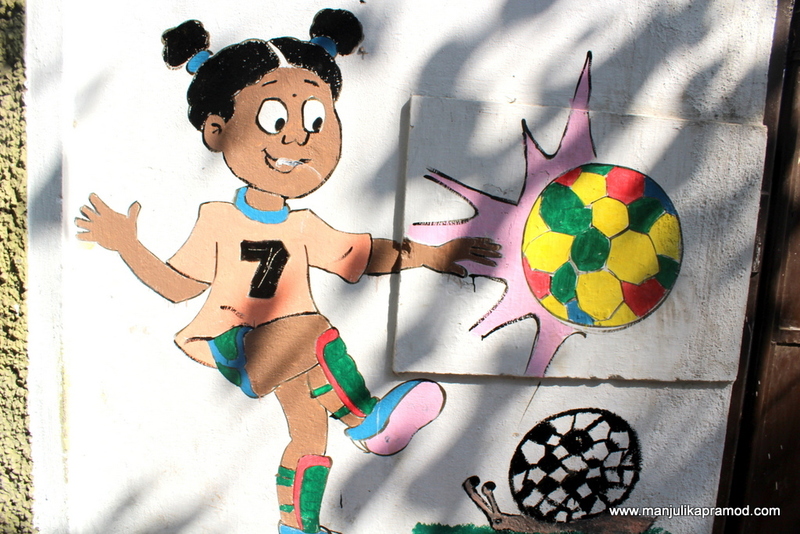 The medium of graffiti has been put to use in many creative ways to increase awareness around social issues. This definitely asserts that a lot can be said through art. Since I am a painter at heart, I love bylanes and streets, bubbling over with graffiti. For me, street art is a celebration of colors perfectly blended with imagination. 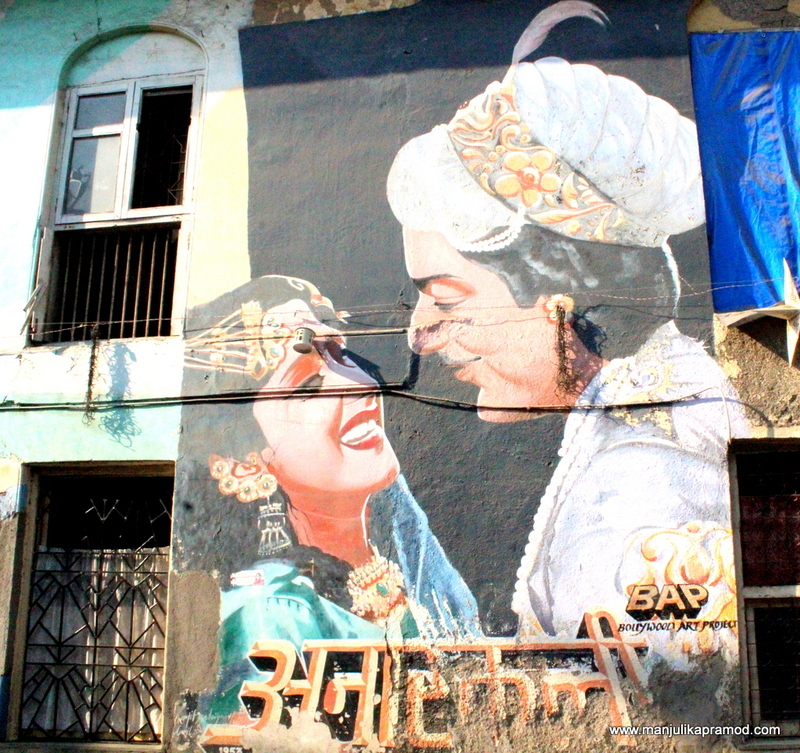 In Mumbai, some of the iconic wall murals are done by Bollywood art project, a project that came into being in 2012 to celebrate the love and fascination for the popular Hindi Cinema and its artists. In the last few years, it has become an important part of the culture of the city and you can’t talk about it without mentioning about artist Ranjit Dahiya. Art is an instant and powerful language! By putting across opinions and emotions, art empowers the citizens of a place. One street art can say more than a thousand words. Street Art and graffitti can create vivid cityscapes. It not only enhances the aesthetic value of the place but also gives a peep into the culture and lifestyle of the city. The silent drawings and vibrant colors add a lot of character to the neighborhood. Such is the power of street art that a small piece of work made by a skilled artist can inspire hundreds of on-lookers every day. Today’s traveler doesn’t only look forward to touristy places, they also look for a concept which they can relate to. Graffiti and murals is in vogue these days. All over the world, street art has been transforming neighborhoods in many ways and boosting tourism. 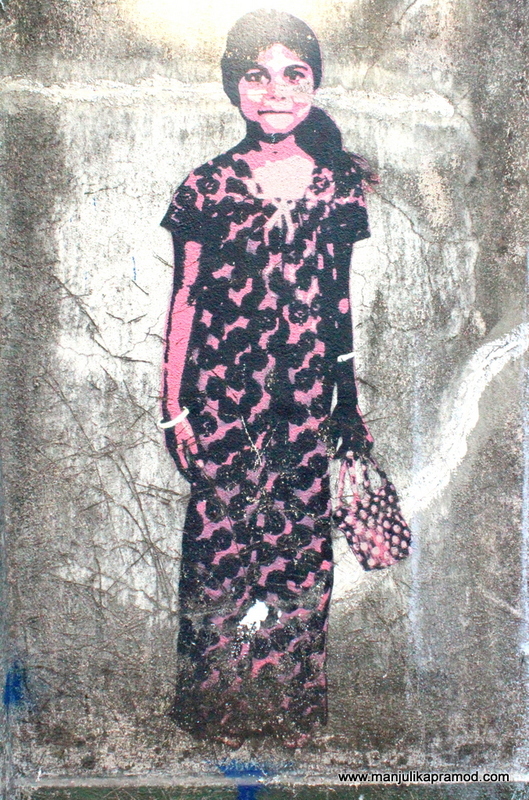 In India, Mumbai can definitely be our street-art capital. Cuffe Parade, Pali, Churchgate, Chapel Road, Colaba, Sassoon Docks, Ghatkopar East are home to some of the most amusing and interesting art works. For lovers of all things artsy, I am listing down some of the most popular art spaces that you just can’t miss in the city. You just need to go, walk around, take help from the locals, discover them for yourself and soak in the joys of imagination and creativity. Every time I walk into these places, I am elated to find something new. 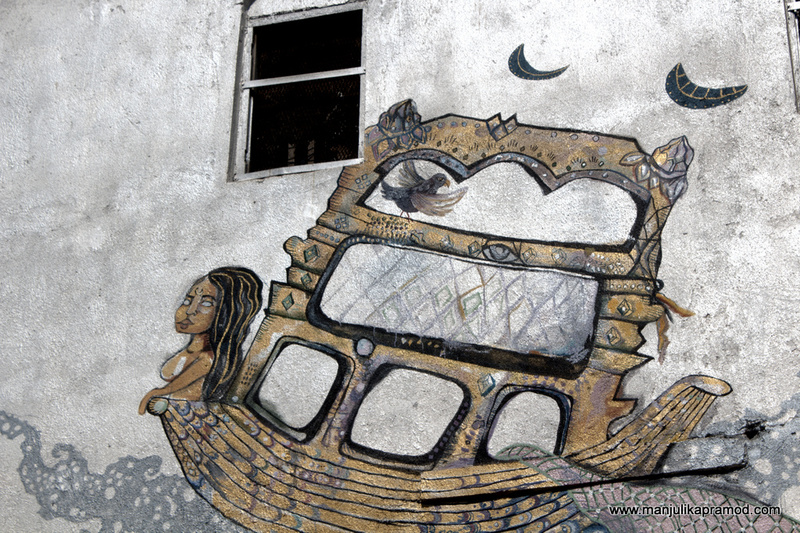 There is maritime related graffiti on the walls of Lion Gate in the town area. This is one of the oldest and iconic art work of the city. If you are guilty of not knowing this place in Mumbai, I must tell you that it is 142 years old dock of India. While it played a vital role in the old trading days, it is a full-fledged fishing district now. The smell of the fishes can be a put off at first but once you will see the huge and amazing art works by street art initiative St+art India, there will be no stopping despite of the bad odour. The visit to the Sassoon Docks will also give you a chance to peek into the life of Koli fishing community, where women play a very important role in the fishing economy. No doubt, some of the fabulous art works are dedicated to them. Asalpha is perched on a hill top. You can see this little patch of colors from the Mumbai Metro if you board the Ghatkopar and keep your eyes on the right. It looks everything but a slum neighborhood. Once you land up there, you will be surprised to see it bright and alive with colors, wall arts, murals which captures the essence of the place. Some of the residents were reluctant initially but once the Chal Rang De (Let’s Paint It) volunteers started their work, everyone came forward for all the help that was needed. The change was loved by all. 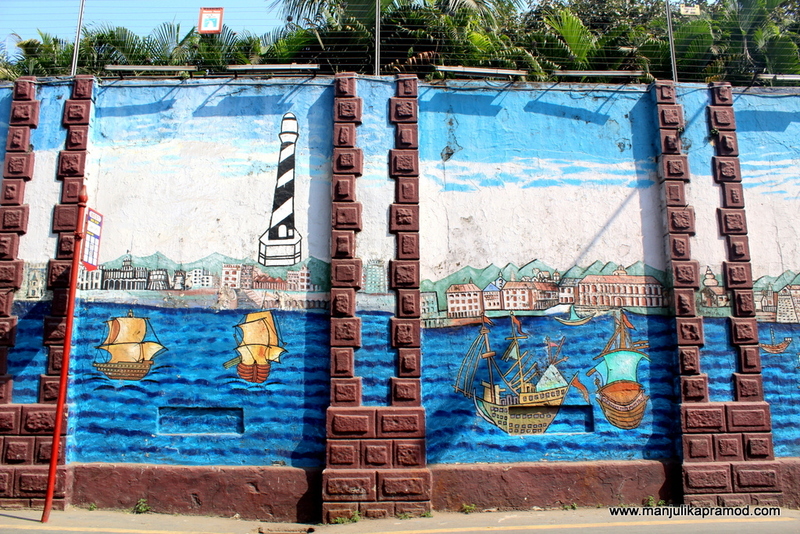 This wall art comes with a purpose and it is helping to change people’s perception towards slum areas, is attracting locals and tourists and is making the residents more thoughtful for a bigger purpose where they can use this makeover to earn money. For me, Bandra begins where there is a colorful mural of Dilip Kumar and Saira Banu standing tall on the walls of Rizvi Chambers. And then you must walk deep into the lanes of Chapel street to find huge artworks like the one of Madhubala. Chapel road connects Mount Carmel Church to Hill Road. This is a very artistic place and deserves a mention for it has art work from some of the most famous artists from all over the world. Many styles of work can be seen in here. It is lots of fun to walk from one lane to another, for you never know what you’re going to spot around the next corner. 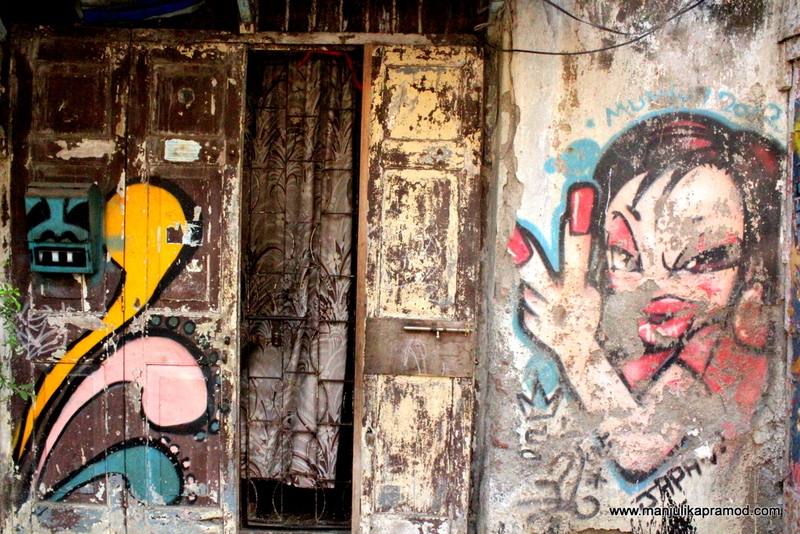 This part of Mumbai has some free-spirited graffiti to explore. Various local tales are sprawled across walls of the stations of Mumbai. Some of the social messages are very relevant and I think stations are just the right place to voice them in the form of art. At every other station, you will be surprised to find something interesting, something colorful to make you experience the little joys of life. While I wish all of the street art was done with the help of water-resistant spray paints, I wish Mumbai also had some rain activated street art, the type of art which becomes visible when it rains. Some artists are using invisible ink street art in some countries which can be seen under certain conditions. But before we ask for more, just go and enjoy what we have.